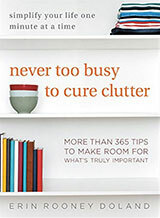 When you think about uncluttering, you probably think about the stuff or the papers in your home or office. 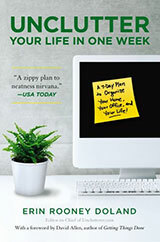 You may also think about uncluttering your calendar or your relationships. But here are two different types of uncluttering I’ve read and thought about recently. The hotel industry loves to fill rooms up with things, which comes from the idea that a hotel room is an extension of your home. But for me, it’s too much stuff, too much clutter. If I’m going to spend three days in there, I need to be really free and able to think. I take every piece of paper, every note or book, and put it in drawers to hide them. I don’t like visual clutter. And in the bathroom, too — there’s a crazy amount of stuff they shove in there. I read this and thought about how I do almost the same thing when I’m in a hotel room with such amenities. Everything I won’t need — the TV remote, the magazines, and most other hotel literature — gets put away somewhere so I won’t see it in the coming days. I stash away the excess pillows, too. You’ll find countless lists of 5-ingredient recipes, which can certainly make preparation easier. Also, limiting the ingredients may mean that you buy fewer ingredients that get used in one recipe and never again, so they sit around just taking up space. But Malone seems to be thinking more along the lines of food writer Christopher Hirst, who stated in the Independent, “My favourite food involves the least possible culinary intervention — dishes where the quality of the ingredients is allowed to speak for itself.” Uncluttered dishes have benefits beyond saving time, money, and storage space — they often taste wonderful. 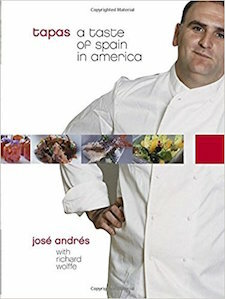 As noted chef José Andrés says, “Simple ingredients, treated with respect … put them together and you will always have a great dish.” I took a brief look at his tapas cookbook, and I saw many recipes that adhered to this principle. The writers advocating for these uncluttered recipes aren’t saying that more complicated recipes don’t have their place, but rather than simple ones can be outstanding, too. When I think back to some of my most memorable meals, it’s often the ones with a few high-quality ingredients, well prepared, that come to mind. Do you unclutter your hotel rooms? Do you like uncluttered recipes? Please share your thoughts in the comments. Hotel rooms leave paper clutter (brochures, coupons for food in nearby restaurants, misc. flyers on places to see, shop, booklets) which I put in the drawer. I do like uncluttered recipes and do basic simple foods, using herbs, spices day after day. The most visually comfortable hotel room I stayed in during this recent trip was, by necessity, quite minimalist and streamlined. It was so small that there was no room for a closet, a table chairs or anything like that. Just a bed, a nightstand and two small shelves below the TV to place clothes, toiletries or other stuff. There was also a large window overlooking an amazing landscape, but that added to the beauty of the place, rather than clutter it with trinkets. I usually move the furniture around in the hotel room to make it function better. It only takes a couple of minutes, and is well worth the effort. Dining tables and chairs, and armchairs and ottomans usually need moving . Simply moving the long edge of a dining table parallel to the wall and pushing the table right up to the wall makes a lot of space in the room. Most families don’t have a sit-down meal in their hotel room. Make sure to leave the Do Not Disturb sign on your door during the day, if you don’t need clean towels, and the furniture will stay the way you like it. I don’t usually unclutter my hotel room, because I’m rarely there more than 1 or 2 nights and I figure it makes more work for the staff. I do enjoy simple recipes though. I’ll leave the hotel rooms for others but the question of uncluttering meals is tricky. I grew up at a time and place where there were always about a half-dozen dishes on the table at dinnertime, which was always called supper. Most dishes were plain and very well-cooked and could not have been less cluttered. None were prepared with the aid of a cookbook. Nothing was served straight from the pot, either. None of this describes the way my wife and I have dinner, which we do not call supper. The kitchen counter may be cluttered and virtually always is but a cluttered meal?